Oats, known for its cholesterol lowering property, has been a part of my breakfast in the form of oats porridge for a long time now. 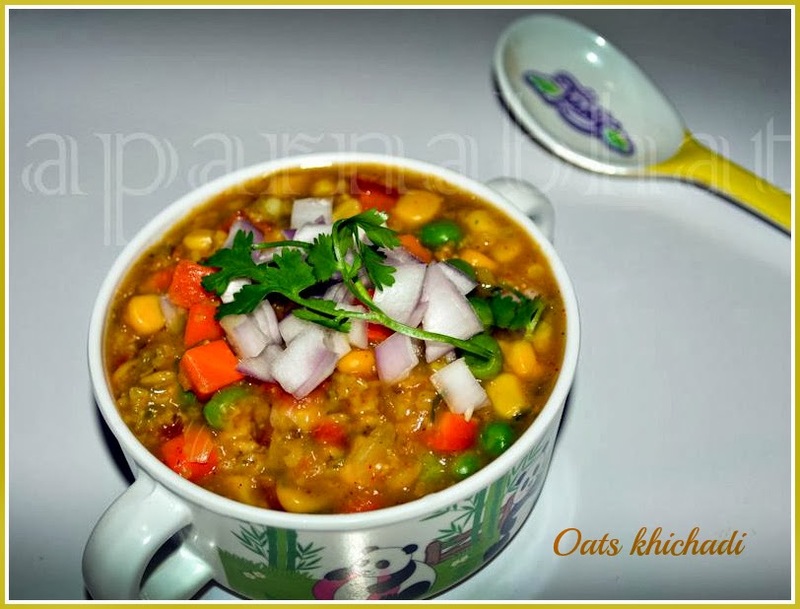 I am on lookout for different recipes to make oats dishes more tempting, and incorporate them into our daily menu not just for myself but for my family. While browsing for the recipes I came across this recipe at Sharmispassions. I tried to follow her recipe and made some variations to suit my family requirements and also as per the ingredients availability. Coriander leaves finely chopped to garnish. salt as per the taste. Dry roast oats on medium flame for 2 mins till nice aroma comes. Keep this aside. Boil mixed vegetables with little salt [ Cooked in pressure cooker till 2 whistles]. Heat olive oil in a pan, add cumin seeds. As they splutter, add chopped green chilli, chopped onion and sauté it till the onions turn pale pink. Now add roasted oats, chopped tomato, haldi, red chilli powder, garam masala and saute it for 1 mintue. Take care that the mixture or dry masala doesnt get burnt. Add cooked vegetables, salt and water. Mix it well and allow it to cook on medium flame till oats turn soft and reaches porridge consistency. [You can adjust the water to reach the required consistency]. Sprinkle finely chopped coriander leaves, some pepper powder [optional] and switch off the flame. Serve it hot with raita, onions or you can sprinkle some sev before serving.